The rigorously modular construction of R. STAHL's SH and SHW wire rope hoists permits practically unlimited combinations of components both for simple and customized solutions. The modular system ensures efficient production at the highest level of quality and maximum flexibility. Five frame sizes of the SH range with 26 S.W.L. 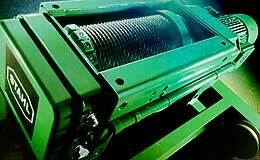 variants, from 1/2 ton to 1,100 tons, are available and can be used in standardized cranes, custom-built cranes or in overhead conveyor systems. 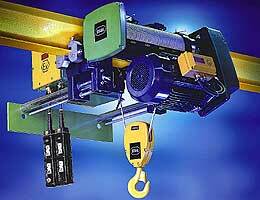 R. STAHL's SH wire rope hoists are also available in explosion-proof design. R. STAHL was the first manufacturer to implement the latest rigorous European ATEX regulations on mechanical explosion protection in the whole production range. 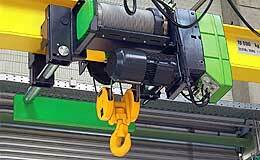 R. STAHL SH wire rope hoists: This range will play its part in any application! The strongest point of the SH wire rope hoist range is the concentration of power and function in ever more restricted space. This is accompanied by innovative design, maintenance-friendliness and R. STAHL's proverbial reliability. The comprehensiveness of their standard equipment and the wide range of the most varied options turn R. STAHL SH wire rope hoists into universally applicable top performers. The R. STAHL wire rope hoist is one of the most progressive designs available today. Compact, powerful and particularly maintenance-friendly, these are just three of the many advantages of this major innovation. On this series, motor, gear and drum are arranged behind one another on a common axis. As the motor is situated on the outside, maintenance work is facilitated and heat dissipation improved. The AS70 wire rope hoist has proven itself in the heavy load range up to 55 tons (with four falls) since 1992. R. STAHL has a worldwide reputation as explosion protection specialist. This is also attested to by the SH wire rope hoist program. The explosion-protected SH types have approvals for use in Zone 1. In addition however a program of explosion-protected cranes, wire rope hoists and crane components specially optimized for Zone 2 is available. It meets the relevant regulations with reduced technical complexity and corresponding cost advantages. R. STAHL always offers explosion-protected products from a single supplier. The fact that all components of a hoist or crane are of our own manufacture – from motor and brake up to control and switchgear – guarantees optimum explosion protection. In this respect, R. STAHL Fördertechnik GmbH utilizes the synergy effect from the equally specialized and comprehensive know-how of the ”Explosion Protection“ Division of R. STAHL Technology Group. 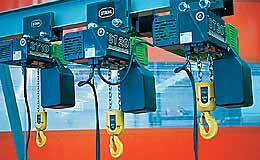 R. STAHL's ST chain hoist program is one of the most striking and wide-ranging on offer in the world. In use in thousands of applications for decades, modernizezed and optimizezed over and over again, the R. STAHL chain hoist is a classic. The ST series is available in 12 S.W.L. ranges from 250 pounds to 11,000 pounds. It can be used as a stationary hoist with a suspension hook, with rigid mounting, with push or electric trolley, and is particularly suitable for rugged industrial applications. The innovative and pioneering chain hoist design offers considerable economic advantages. The extremely short headroom available as an alternative to every type of chain hoist optimizes the effective hook height and reduces wear on the chain. 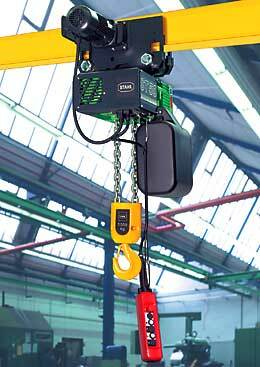 R. STAHL's ST chain hoist program is also available in explosion-protected design for Zone 1 and Zone 2. 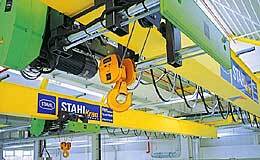 R. STAHL was the first hoist manufacturer to implement the ATEX regulations in the whole chain hoist program. R.STAHL is setting new standards with the extra short headroom trolley. Its headroom, reduced by 60%, means that maximum hook paths can be achieved, in particular in extremely low rooms. The extra short headroom trolley lives up to its name, headroom's of just 8.25 inches for 11,000 pounds safe working load and 7.25 inches for 7,000 pounds safe working load are unique in the hoist industry. Thus once again R.STAHL is a pioneering and revolutionary force in the field of hoist and crane technology. The vertically mounted hoist with two load chains used in this application is based on standard components tried and tested over the years, so that the design combines maximum reliability with the greatest possible cost effectiveness. Please contact Met-Con today for a quotation on your overhead handling and crane service requirements.